It's Illustration Tuesday. 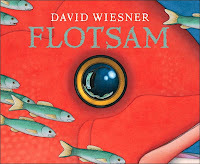 David Wiesner has won the Caldecott medal three times. Read about him here. Watch him talk about his work, and then look at a trailer for Flotsam, below.